This post contains affiliate links. For more info on that click here. 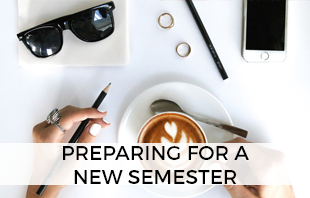 Starting a blog can be one of the most exciting and stressful things you can decide to do. One year ago, I was trying to figure it all out by guessing. I had no clue what free blogging platform I should start on. I had no clue how to connect to other bloggers or how to promote my posts. I had no idea what I was doing. I absolutely love the things I have discovered about myself and the world through blogging. I love the support I am getting from my friends, I love the thrill of being creative, I love the little adrenaline rushes I get when I publish new posts out there for the world to see.. I really love blogging. I truly believe that everybody should try blogging at some point in their life, and I feel like everybody can do it. Maybe right now you’re too busy, or maybe right now you’re just the right amount of busy to have something interesting going on to share with the world. There’s no need to know HTML, CSS, or be super computer or tech savvy. All you need to know is how to type on a computer, how to write something that people can relate to, and how to access the internet (by reading this blog post you’re at least 1/3 of the way there)! Blogging can cost money, which is very off putting for people who aren’t sure if they will stick with it or not. I wasn’t sure, so I did a lot of research into the best blogging options for free and tried out a couple of options. Pretty much, I’ve done the trial and error for you. 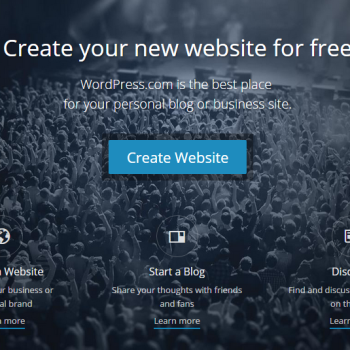 If you are ever hoping in the future of purchasing your own domain and possibly making money off your blog, but you don’t want to start off right away paying for anything: The best way site to use for is WordPress.com. WordPress.com is the free version of WordPress blogging and site managing. There are a lot of limits to it, unfortunately, but it is incredibly powerful and well known. It is also an incredibly handy tool to use if you want to eventually switch over to paid hosting (which is through WordPress.org) blogging to step up your site to the next level. It is incredibly easy to move from WordPress.com to WordPress.org once you are ready. If you’re looking for a guide on how to start a blog on a self hosted platform (which will cost your money) you will need to purchase hosting. 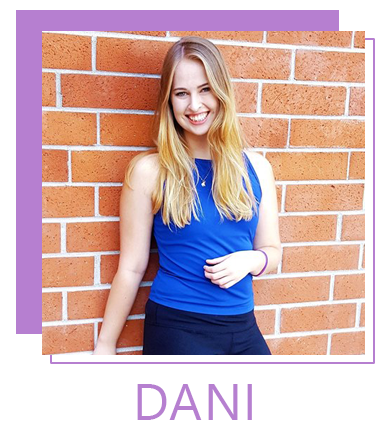 Since you’re a reader of Dani Dearest if you sign up for hosting with Host Gator using this link then you will get 20% off your hosting plan! If you are looking for a guide to move from WordPress.com (free) to WordPress.org (paid) when you are ready, check out this helpful guide by WP Beginner! Now that that is out of the way, let’s get started making your own free blog! First off, go to WordPress.com and click to create a new site. Choose what you want the URL to be (this will end in .wordpress.com which is a great way to start! 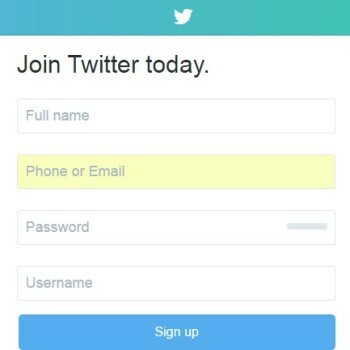 ), and create your login information. Next, it’s time to choose a theme. I started off with something simple, but remember that you can change your theme as you go through so don’t worry about finding the perfect one right now. Then it will ask you to choose your plan, select that you want the free plan. I seriously do not recommend using the WordPress.com paid plans, if you are going to pay for your blogging I would recommend going with WordPress.org because you have access to a wide array of extra features. Since you are using WordPress.com and everything is completely free, your customization options are quite limited. You can add a header image, background images, and tweak your theme in other small ways. 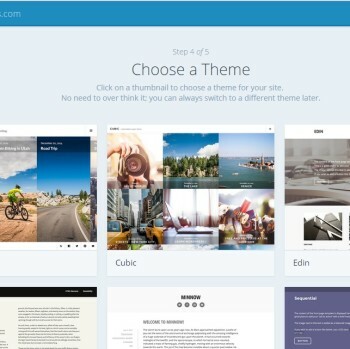 Click to customize your site and take a look at the different options your theme comes with. You can also go in and change your theme and see what works for you! I recommend getting a theme that includes an option to put up a header image as this is the best way to significantly personalize your theme without having to spend any money. A great banner with a great logo can really go a long way in branding your free site! While you’re checking out the customization options for your theme, make sure to check out the “Theme Options” tab if your theme provides one. Those are where some of the best customizing options hide! Once you’re finish, press “Save & Publish” and your customization will go live. 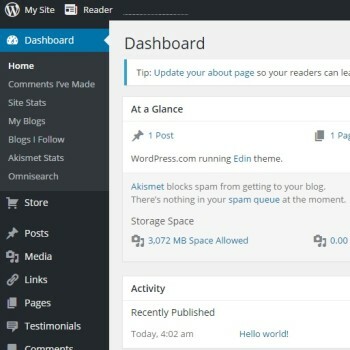 After saving your customization’s you will be taken to the wordpress.com dashboard. Here in the future you will be able to see your statistics, your posts, pages, etc. However, this is not as useful as your site dashboard itself. Click on the tab labeled “WP Admin” or go to yoursiteurl.wordpress.com/WP-Admin. If this is your first time using the dashboard you’ll see the option to view some WordPress resources that will give you a general tour of the area. Try them out! Get to know your dashboard. This dashboard is the place where you will log into to write any blog posts, make any edits, change customization, view statistics, upload media files, and so much more. A definite must-have is an “About Me” page. 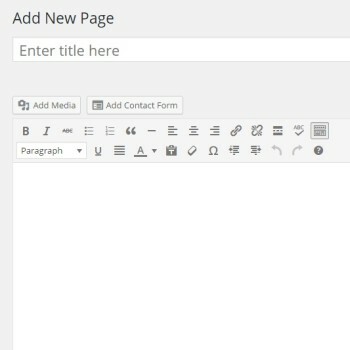 WordPress.com already starts an “About” page for you, so go to “Pages” > “All Pages” to view all the pages that have been created and select to edit your “About” page. Upload a picture or two of yourself by pressing the “Add Media” button, insert some interesting facts and information about yourself and the hopes that you have for your blog. Need some inspiration? Check out my About Me page to see what I do. Quick Tip: You may want to add yours extra pages, categories, or other links to your navigation menu on your blog. To do this, go to “Appearance” > “Menus” and select the pages to add to your menu. 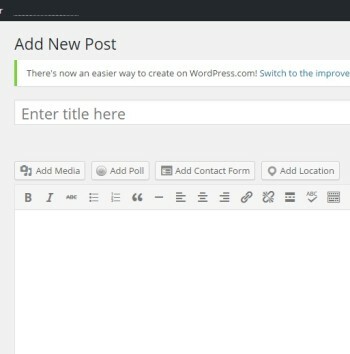 Now you’re set to write your first blog post! It’s a good rule of thumb to include at least one image for each post. In addition to adding this image to your post, scroll down to the bottom right hand side until you see the box labeled “Feature Image” and upload the image there as well. This will make the post look better when it appears in your archives later on and will save you a lot of time. After your post is written and formatted to look pretty just the way you like it, preview to make sure it looks good. Then you can either publish it live right there or schedule it to go live another time. I will go more in depth into how to publicize posts at a later time, but here are the basics that you should get a head start on. You should decide if you want to incorperate your blog posts and blog social media into your personal social media channels, or if you want to create new ones for your blog. If you create new ones for your blog it might be a good idea to make sure that the usernames/handles are the same as your blog URL to help your readers find your social media. Social media channels to consider making: Twitter, Pinterest, Instagram, BlogLovin’, Facebook, Tumblr, Snapchat. 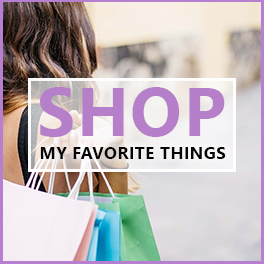 I personally only have a Twitter, Pinterest, Instagram, BlogLovin’ and Facebook for my blog! Blogging community groups on Facebook are a fantastic way to meet a lot of other bloggers and share your work. Without these groups, it definitely would have been a lot harder to get my first few views. They’re tried and true and super useful! 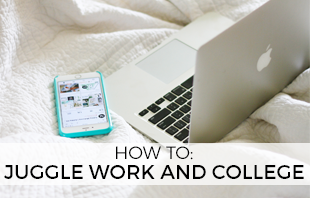 Some of my favorite groups that you can look up to join include: Blog Love, Blog it Forward, and The Blogging Elite. These groups have daily blog post threads where you can share your recent content and check out other’s as well. It’s a great way to get comments and views from other bloggers. Once you get more views I recommend that you look into joining the Her Campus Blogger Network, as they are a huge help with everything! How did you start your blog? 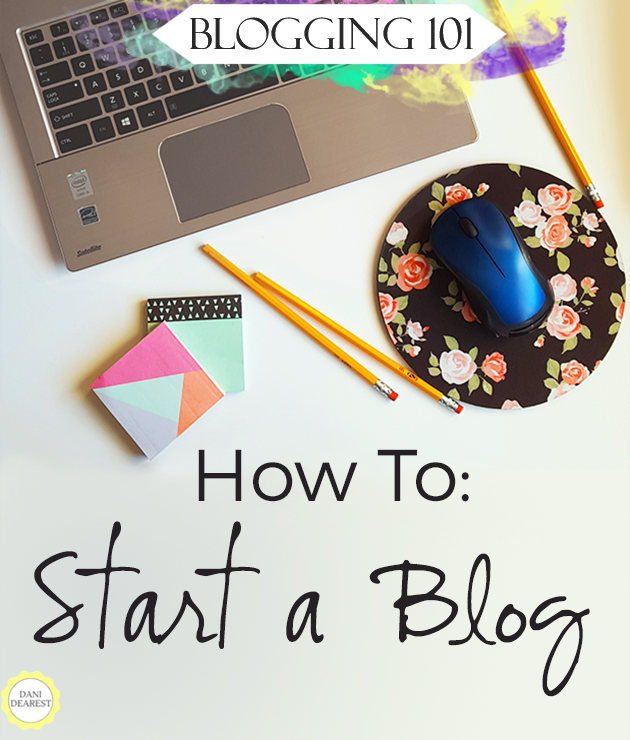 Or are you thinking of starting a blog? Great guide! I wish I saw this when I was starting my blog! These are great tips- I bet they inspire someone to start a blog :). I was shocked initially at the level of investment (financially and time wise) I had to put in to understand a self hosted WordPress account after 6-7 years on blogger. I started blogging back on livejournal.com in 2001. Then bought my domain and did photography and wrote event reviews for raves. For a long time my site just hosted pictures from events & zines I wrote. Then 3 years ago I started a blog and interviewed DJs, producers and performers. I just recently turned my blog into a lifestyle blog because I submit music to other bigger blogs. I wish wordpress would have been around back then, I used to hand code all my entries. A lot of good tips, and I especially like the part that you have enjoyed discovering things for yourself. I would add that the first thing one should do is make sure they get a good domain name. Google it. See if it comes up with strange things, and then make sure you can get all the social media with it. In other words, brand yourself before you start and know you will probably change directions somewhat from where you thought you were going. How fun that is. Question: do you have to set up your own paid domain to make money blogging or can you use the free version and still host ads and affiliate links? If you use the Blogger platform you can make money with Ads and Affiliate links without paying for your own domain. However, if you use WordPress you must being using the paid version of WordPress in order to use Ads. I believe you can still use Affiliate links using the free version of WordPress, but not ads. Hope that helps! 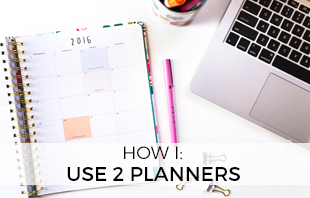 I used to think that blogging is rocket science when I started about a year ago. So, I paid someone to help bring my dreams into reality. And after spending so much money on the project the guy just absconded leaving me high and dry. Then I decided to take the bull by the horn. Now with so many tips from Pinterest and good folks like you I know I will achieve my dreams. Thanks! New to blogging. Interested in starting my own. I’m always reading others, and see myself wanting to share my recent experiences as a new mom. Having a hard time with a domain name 🙁 wont be giving up, but can’t go on without one. Thank you for sharing. All of your tips have been very helpful. I was overwhelmed by the process that it literally took me a month just to work up the nerve to start brainstorming for a blog site. The areas that I am still confused about is designing a website (a layout that I will be known for and who do I have to pay to do it) and gaining followers. I will be opening a twitter account, but I am worried about the dedication to my personal and the blog accounts. Optimistic I will get a handle on this. Thanks for the tips! This was a great post! So very helpful. My only question is how do you go about deleting your whole blogging account if you decide that blogging didn’t work out for you? I’d like to try blogging, but I’m afraid I won’t be able to fully commit to it forever. Thanks!! If you start blogging and realize that it’s not for you you can totally just go in and delete the website, or even just stop posting! If you stop posting the old posts will still be up there, but there’s never any commitment to continue to post, it’s all based on what you want. However, if you would rather delete the site you definitely can. This is an extremely useful post as I really want to start blogging as I’m entering my sixth form years (year 12 & 13 = 11th & 12th grade) and want to have somewhere as an outlet. I used to blog years ago when I first started secondary school but didn’t really get it and wasn’t very good! ;D Hopefully this time will go a lot better! Any tips for coming up with a name? Congrats on starting your blog! It is definitely exciting, and sometimes frustrating. When I first started my blog I also heard the same info, that buying your domain and hosting right off the bat was essential. However, I am SO glad that they were wrong and that starting off with a free blog was right for me. While you cannot monetize a free blog (the only downside, if that is what you want to do) it is ideal to use as a trial period to check out and see if blogging is really for you. You can absolutely be successful on a free blog, no matter if you stay “free” forever or if you decide to purchase a domain and hosting in the future. Good luck on your blog, I wish you the best!